Even though Fall hasn't officially started and it still gets hot around here most days, I'm so ready to start all my Fall baking. I thought I'd start with a delicious breakfast treat. I love pumpkin flavored foods and I thought Pumpkin Pie Cream Cheese sounded like a great idea yesterday after my trip to get fresh bagels. I usually get plain bagels so that you can add whatever flavoring you like. Some people just use butter (why? I have no clue) some use plain cream cheese, but my kids and I usually use cream cheese and my Homemade Strawberry Jam. I thought with Fall around the corner and my obsession love for all things pumpkiny why not make some homemade spreads for bagels. 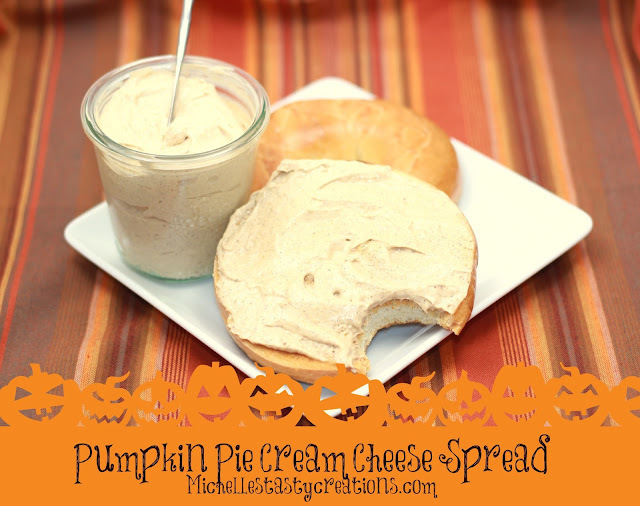 So here is the first one I came up with; Pumpkin Pie Cream Cheese Spread :) And I'm thinking Apple Pie spread might have to be next (wink, wink). If you like pumpkin flavored goodies, I know you'll love this one! In a bowl beat the cream cheese until fluffy. Add the pumpkin pie spice and mix until incorporated. Add the pumpkin puree and sugar and beat until fully incorporated and smooth. Toast a bagel of your choice. Let cool a minute or two then spread with Pumpkin Pie Cream Cheese. Yum, Yum, Yum! The best way to spend breakfast in the Fall.